This oystercatcher is the national bird of the Faroe Islands. 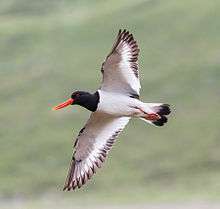 The oystercatcher is one of the largest waders in the region. It is 40–45 cm (16–18 in) long, the bill accounting for 8–9 cm (3.1–3.5 in), and has a wing-span of 80–85 cm (31–33 in). They are obvious and noisy plover-like birds, with black and white plumage, red legs and strong broad red bills used for smashing or prising open molluscs such as mussels or for finding earthworms. Despite its name, oysters do not form a large part of its diet. The bird still lives up to its name, as few if any other wading birds are capable of opening oysters at all. Bill length shows clinal variation with an increase from west to east. The subspecies longipes has distinctly brownish upperparts and the nasal groove extends more than halfway along the bill. In the subspecies ostralegus the nasal groove stops short of the half-way mark. The osculans subspecies lacks white on the shafts of the outer 2–3 primaries and has no white on the outer webs of the outer five primaries. 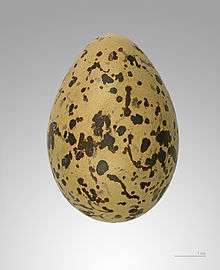 The nest is a bare scrape on pebbles, on the coast or on inland gravelly islands. 2–4 eggs are laid. Both eggs and chicks are highly cryptic. The scientific name Haematopus ostralegus comes from the Greek haima αἳμα blood, pous πούς foot and Latin ostrea oyster and legere to collect or pick. ↑ BirdLife International (2015). "Haematopus ostralegus". IUCN Red List of Threatened Species. Version 2015.2. International Union for Conservation of Nature. Retrieved 26 November 2015. 1 2 3 The Birds of the Western Palearctic (Abridged ed.). Oxford University Press. 1997. ISBN 0-19-854099-X. 1 2 Lockwood, W.B. (1993). The Oxford Dictionary of British Bird Names. Oxford University Press. ISBN 978-0-19-866196-2. Wikimedia Commons has media related to Haematopus ostralegus. "Eurasian oystercatcher media". Internet Bird Collection. 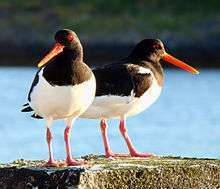 Audio recordings of Eurasian oystercatcher on Xeno-canto.